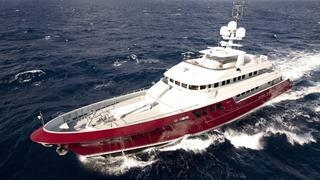 Great news from Walter Sea at Camper & Nicholsons that he's closed on the sale of the 46m Cheoy Lee motor yacht Mazu. Launched in October 2010, she is the second in the yard's Marco Polo range designed by Ron Holland. Lloyd’s classed and MCA compliant, her hull is in steel with a composite superstructure. She is powered by a single Caterpillar 3512B engine of 1,911hp giving a long range of 6,600 nautical miles at an economical speed. She offers tremendous interior living areas, but still measures under 500GT. As with her sister, Mazu puts the captain’s cabin on the main deck forward (and to starboard of the library) so the owner enjoys a three-room suite aft of the bridge plus open-air lounge. Of four possible guest cabins on the lower deck, one is arranged as a gym with full en suite. With a built-in daybed, it can convert to a nanny cabin. The décor is contemporary with horizontally banded gloss-finished Macassar ebony making up much of the panelling and built-in furnishings. Rich walnut floors add a masculine look. Window treatments are simple so as not to restrict views, while the sophisticated, multi-level lighting design creates suitable night-time ambiance or brightens grey days. Mazu was asking $25 million and has been renamed Qing.